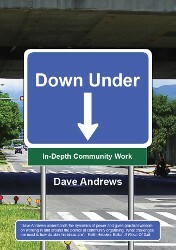 Down Under has been written in response to the questions that Dave Andrews, the worldrenowned Australian community worker, has been asked again and again by community workers all over the world. And the answers that he shares with us in this book have been forged and tested in the fire of his own personal, vocational and professional experience as a grass roots community worker. Down Under addresses the adverse effects of professionalisation and institutionalisation in community work and seeks to explore effective ways of resisting demands for compliance, holding the line and creating space for change. Down Under concludes with the wonderful example of Dave's partner Ange's in-depth, hands-on, face-to-face community work with refugees. Noel Moules, Author, Fingerprints of Fire, Footprints of Peace. Keith Hebden, Editor, A Pinch Of Salt. How can we ignite soulful community work in the real world? Dave Andrew's new book is a confronting yet affirming read for all community workers. It challenges both personal and organisational practices, questioning who is truly being served in the rise of the professional "'community worker"'. Meanwhile, the book talks about the complex reality of the "'unravelling threads of community"' which community workers attempt to re-weave on a daily basis. Dave and his references paint a profound picture of the forces at work in our world, country, organisations and neighbourhoods that are eroding our sense of home, safety and belonging ("'community"'). The losses are significant and recognising them assists us to restore hope amongst the mess. Dave will inspire you to persevere whether you work within the professional service system, are creating alternative models, or are attempting to build a bridge between the two. His critique of the professionalisation of community work is not for the faint-hearted. Inspired by the humility of Christ, Dave challenges community workers to reflect on the systems of power they work within. His analysis stirs a healthy degree of discomfort with current community service practices. But instead of being filled with gloom, we are propelled forward to radical action with loads of principles to underpin the critical task of community work. This is a text well worth ploughing deeply into for anyone beginning their community work journey or for those more experienced to use within their current team or organisation. It will challenge any community worker to truly understand their context and improve development practices. Dave intertwines key academic and practitioner voices to light a fire for vocational community workers that will be hard to extinguish. At so many points I wanted to put this book down and act! "Dave Andrew's book Down Under is a brilliant read for every social worker, community worker and community ally who believes in humanity and the power that each human being possesses to assist other people. It challenges your values as a human being working with less fortunate and/or more vulnerable people who need assistance. It makes you seriously consider why you are doing what you're doing, what drives you to do what you do, and whether what you are doing is assisting the people that you are assisting. It makes you think about your practice in bureaucratic organizations and how these bureaucratic organizations tend to shape your practice even if you disagree with the bureaucracy. The beauty of this book is that it inspires practitioners to be the change. It encourages you to be a person who really commits to a passion for change, to be a person who really cares, to be a person who really treats people with respect and dignity and autonomy in spite of the bureaucracy, to be a person who really advocates for the betterment of people even if it means you are in conflict with organizational protocols because of the funding guidelines associated with a certain program. This book brings you back to real, radical, grassroots work - where practitioners, people and the community are all involved together in creating a better outcome. An outcome that works for everyone, because practitioners walk alongside the people, accept the people you work with have the power to solve their problems and unlock the secret to this power through empowerment by advocating for the people to be in charge of decision making, giving them a voice and giving their voice legitimacy". Salam El Marebi, Social Worker, AMARAH. Dave Andrews' book will have most people committed to finishing the whole book after the first two pages, where, citing research he demonstrates that connectedness leads to better outcomes for people in health, happiness, honesty, generosity, prosperity (non economic) and safety. When one considers community development broadly speaking, these are outcomes most people working in the community sector would see as positive outcomes in their roles. At its heart this book is a call to get back to relationships in human services and community work. However its deeper message is about authenticity and being true to one self. Prior to developing his main thesis, Dave Andrews undertakes a quick survey of how communities and connectedness has diminished. He attributes this loss of community to numerous factors. Materialism, the advent of large shopping malls leading to the "'privatisation of public spaces,"' the rising numbers of people leaving smaller rural communities to live in cities and the impacts this will have in developing nations such as China and the correlation between commuting to work, where he suggests a 10 minute commute will decrease by 10% the ability to develop meaningful relationships. Churches have not been immune, as some churches establish regional centres at the expense of local churches involved in their communities. The underlying reason he advances for the decline in community is the increasing focus on self through the pursuit of money, fame and influence at the expense of relationships and experiencing the love of others altruistically. Research on student motivations for going to college indicated money as a driver had increased from about half to three quarters over the 20 year period to 1990. Dave Andrews goes on to demonstrate how this has all led to a loss of community volunteers with no special skills other than interest and concern, who have historically done the things which met the needs of people and how the professionalising of community development has resulted in communities losing their soul. His exposition of the 10 dangers of professionalisation of community work and the seven propositions that disempower communities makes this book a required text in all social work educational settings. Those who go into social welfare with good motives, often end up part of "'the system"', more concerned with the professional work they do than the people they assist. Sadly, Dave's thesis is my experience. As a human services professional in the public sector for four decades, I have often espoused the view that governments cannot fix community problems or solve the problems of individuals. How can a bureaucracy which operates on a nine to five basis care for any person struggling with personal problems outside these hours? In 1986 I made my first visit to an Aboriginal community in western NSW and saw firsthand what few Australians had seen for themselves. Many had been before me and seen the same things I saw and the question in my mind was "'how can this be?"' Dave's 10th danger of professionalisation is "'avoiding responsibility,"' a thought that came to my mind all those years ago that my predecessors had "'done their job"' literally. However as a Christian, it was incumbent on me to seek to find long lasting solution rather than sticking to a position description. Having worked in disability, his references to Jean Vanier, who spoke about the suffering of the disabled and their families at the hands of the powerful (defined as doctors, psychologists, social workers and others), resonated powerfully. He advocates deconstructing and reconstructing the professions, so that people seeking to assist really care (rather than empathising as they have been taught) and use their skills and relevant knowledge to serve rather than accumulating power and prestige. This he posits will result in "'amateur, radical and revolutionary activists. This leads into an analysis of bureaucracies and counter bureaucracies. Counter bureaucracies being defined "'in theory, as well as practice, not actually committed to the work, but simply maintaining the system."' In NSW this was evident to me as the politics of NSW ensured a bureaucracy, compliant to its political masters rather than really seeking to serve and deliver for the people it was designed to serve. Rabbi Jonathon Sacks is quoted at length to make a point about the use of power and fear to control people. He expounds Jewish thought on the Genesis account of the creation of man to tell two stories about moving from unbearable isolation to tolerable association. 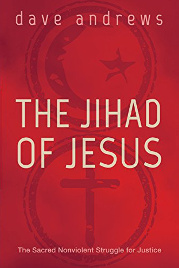 These stories provided me a profound understanding about the roots of Anabaptism, community and non-violence. I am not sure if his was the intention of the author, however the analysis of Genesis 2:23 by Sacks was enlightening. Most readers of the book will identify with the analysis of bureaucracies and counter bureaucracies. Dave summarises the conflicts inherent in both, suggesting that there are two policy options in which both operate – love and fear or community and security. This is neatly summarised in a helpful table which contrasts characteristics and behaviours of both. Compliance and resistance to bureaucracy and counter bureaucracy is examined and helpful suggestions given to assist practitioners resist compliance with bureaucracies. Unlike many books that theorise about subjects such as this and leave readers trying to contextualise how this works in reality, Dave Andrews provides studies based on TEAR Australia and TEAR Fund (UK). Transformation into bureaucracies as they grew but not wanting to lose the "'spirit"' in how they operate are described. Spirit was defined and is not religious in its definition. Many books have been written about spirit in the workplace and Jossey-Bass publishers have a catalogue of books on the topic. The TEAR study describes the practical outcomes of open conversations which were facilitated by Dave Andrews. These resulted in affirmations and suggestions which are person centred and relational, prioritising relationships over bureaucracy. In England, the director of TEAR Fund has authored a paper quoted in this book, describing three qualities of new systems – agility, relationality and glocality. The book concludes with an amazing account of community work undertaken by Ange, Dave's wife who has worked with refugees in Brisbane since 1989. I identified with this book as someone who has resisted bureaucracy while working in large bureaucracies. The practical examples contained in it may assist others challenge the powers. Often people are fearful of large institutions simply because they are large institutions. As government approaches to community services changes throughout Australia, the opportunity is there once again to get back to grass roots and engage with people and communities. The political motive may be that government has recognised its inability (read lack of resources) to do everything and has recognised the community resources and assets better able to engage with communities. Place based planning and decision making is the focus in NSW government policy, and the opportunity is there for people and local organisations and churches to engage locally as governments seek to devolve decisions and resources to locals. This is a must for all idealists graduating from social work and other humanities courses to learn how to "'avoid becoming the system they inhabit"' (P88). Eddie Ozols, On The Road Magazine 2012.